Even though video replay may be useful, it's still pretty low-key. So, like George Lucas changing Yoda from a puppet to a CGI, tennis made the leap to computer rendering. The Hawk-Eye system, based on ESPN's Shot Spot feature, uses cameras set up around the court to track the ball's path and create a 3D rendering of where the ball hits. Besides being used to judge if a ball landed in or out, Hawk-Eye can also be used to analyze a player's strategies. In its sporadic uses, Hawk-Eye has proven effective, usually serving to anger the players whose points get taken back from the replay. Fans of the Tottenham Hotspur were up in arms after a game they lost because a ref wasn't paying attention. The team scored an obvious goal, but the linesman didn't see it and simply signaled for play to continue. That prompted soccer officials to unveil a new ball, partially designed by Adidas, with a microchip in it. The chip would signal the official whenever it crossed the goal, thus negating the effect of refs napping on the job. The ball made its debut at the 2005 Under-17 Championship and has made sporadic appearances since. In terms of accuracy, the ball has been a success, although that could also be due to refs actually doing their job. However, some players have complained that the microchip makes the ball travel differently and is harder to control. Being the home plate umpire in baseball has always struck me as one of the most difficult jobs "“ in a split second, you're expected to determine if a pitch was in or out of an imaginary box. To help standardize strike calling and reduce umping mistakes, Major League Baseball instituted a digital check on its umps in the form of Questec's Umpire Information System. The UIS doesn't correct calls on the field; instead, it compares the computer's results to the ump's. The technology stirred up controversy, with players arguing that it didn't take batters' size into account and was making umps scared to make controversial calls. Arizona pitcher Curt Schilling even smashed one of the cameras in his home stadium with a bat after a particularly rough outing. Reportedly, one of the umps told Schilling to break the other one. After Wayne Gretzky, video replay may be the best Canadian import to sports. A 1957 Canadian hockey broadcast marked the first use of instant replay, a technique that would soon revolutionize sports broadcasting and officiating. Since then, most major sports have adopted rules to allow officials to consult video feeds to correct calls. Baseball is the latest arrival to the replay party, with a recent decision to explore using video replay to check whether a ball has left the park or is fair or foul. Even though replay is used in sports as unusual as rugby, cricket and rodeos, the most unusual use of replay is listed in this Wikipedia entry (though research couldn't find another mention of the incident). 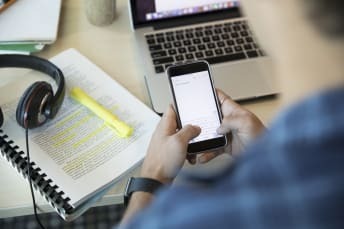 At a high school quiz bowl tournament at Michigan State University, one team argued that the moderator had "allowed more than a natural pause" during a question. A judge noticed that a parent had been taping the tournament and took her camera, using the video to reverse the panel's original decision. It's possible that no athlete has stood in a brighter spotlight from such a young age as four-time NBA MVP LeBron James. Born in Akron, Ohio, on December 30, 1984, James was a multi-sport star as a kid. Eventually, he became just the second of three NBA players to be drafted No. 1 overall straight out of high school (and the only one to go on to win Rookie of the Year). But even if you've followed his career from Cleveland to Miami (back to Cleveland) to L.A., you might not know these 11 details from the story of King James. 1. Two football coaches changed LeBron's life. Gloria James was 16 when she had her only child, and when her mother died just a couple of years later, she and baby LeBron lost their entire support system. They spent six or so years bouncing around between couches and apartments in Akron's projects. Then, when he was 9 years old, he met Bruce Kelker, who was putting together a youth football team. Kelker took LeBron under his wing and the Jameses moved in with him so that young LeBron would begin to have some stability. By the end of that year, another youth football coach, Frank Walker, offered to let LeBron move in with his family. After missing 80-something days of the fourth grade because of their chaotic living arrangements, LeBron didn't miss a single day of fifth grade. 2. LeBron James made the cover of Sports Illustrated as a high school junior. LeBron James goes up for a basket during a game with his St. Vincent-St. Mary's high school team in January 2003. 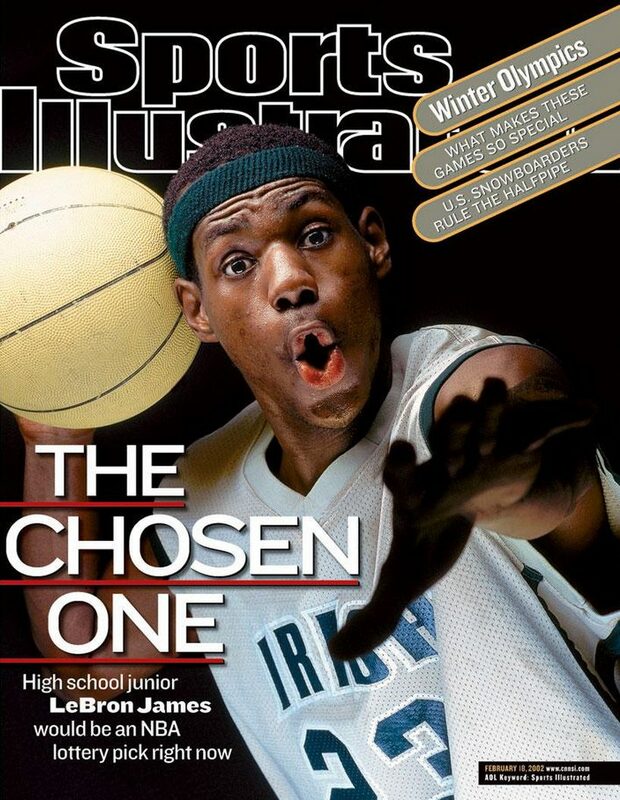 In February 2002, just shortly after turning 17, the pride of St. Vincent-St. Mary High School was anointed "The Chosen One" in a now-iconic Sports Illustrated cover story (LeBron went on to get "CHOSEN 1" tattooed across his back). If the league would have allowed it, James would have entered the NBA draft that year, but draft eligibility hinged on graduating high school—so LeBron finished his senior year with his high school team, nicknamed the Fighting Irish. They won their third Division II championship, and the hype around LeBron and his teammates meant they traveled for high-ranking games that were aired on ESPN2. Time Warner even offered their games on pay-per-view. 3. A broken wrist sealed LeBron's basketball fate. James played both football and basketball through middle and high school, and some have speculated that he could have gone pro with football. But in the June 2002, just before his senior year, he broke his wrist during an AAU (Amateur Athletic Union) game. Because of the two-month recovery time, James decided he needed to forego football season so that he'd be fully healed for his senior basketball season. 4. LeBron subscribes to a "Work Hard, Sleep Hard" philosophy. If you want to be the greatest of all time, you need to get plenty of rest. A whole lot of it, actually. LeBron once copped to sleeping 12 hours per night, though these days he's more likely to get a solid eight hours, with a nap sometime during the day. That extra shut-eye is key considering just how much mileage the man has logged on the hardwood. As of 2019, in his 16th pro season, he's already the NBA's all-time leader in playoff minutes played with 10,049. That's the equivalent of three extra 82-game regular seasons. Another thing LeBron keeps in his health routine? A good red. "I've heard it's good for the heart," he told ESPN the Magazine in 2018. "Listen, I'm playing the best basketball of my life, and I'm drinking some wine pretty much every day." He does, however, have discerning taste. "Bron has a supercomputer in his brain" on the subject of vino, former teammate Kevin Love said, and their Cavaliers teammates agreed that he's usually the one they trust to order when they go out. Luckily for LeBron, his new L.A. residence is just down the coast from Napa. 5. 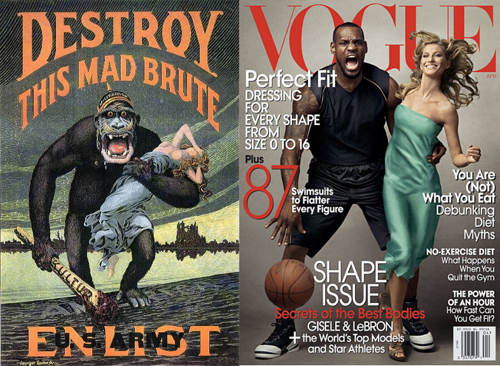 LeBron was the first black man on the cover of Vogue. Only two men had ever made a Vogue cover before LeBron did it in April 2008: Richard Gere and George Clooney. LeBron's cover arrived with controversy, however. Observers noted how much the Annie Leibovitz pictorial, which featured James alongside supermodel Gisele Bündchen, recalled racist U.S. Army imagery from World War I that used King Kong as a symbol of a "mad brute" alongside a white damsel in distress. 6. He's been a leader for labor and is no stranger to collective bargaining. In February 2019, Akron's finest wrapped a four-year term as first vice president of the NBA's labor union, the National Basketball Players Association. As the No. 2 man in the organization, he played a key role in pushing for greater benefits for retired players and realizing a huge jump in the league's salary cap back in 2016 that changed the financial prospects of the upper and middle tiers of pro players (and helped the rival Golden State Warriors cement a dynasty by buying up a roster of top talent). 7. LeBron wasn't the highest-paid guy on his own team until age 31. James was the NBA's highest-paid player overall in the 2016-17 season, but he played a dozen years of professional ball before even being the highest earner on his own roster. He was surrounded by a number of league veterans during his first stint with the Cleveland Cavaliers, including an aging and injury-wracked Shaquille O'Neal, and James famously agreed to take less than his full market value in order to form a super-team with the Miami Heat in 2010. 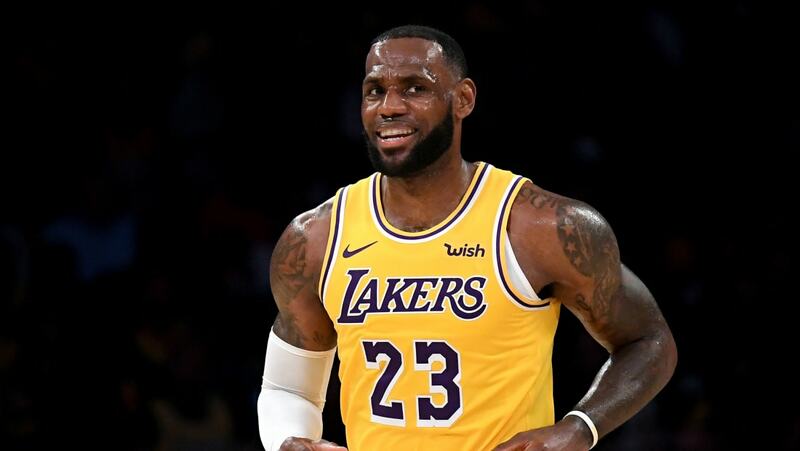 He hit the top of pay grade during his second go-around with the Cavaliers, and his new four-year deal with the Lakers puts him on track to be the highest paid player ever. 8. LeBron has helped fight for parity in non-sports arenas too. When Oscar-winner Octavia Spencer was in salary negotiations with Netflix over her starring and executive producing role in an upcoming biographical series about groundbreaking entrepreneur and first female self-made millionaire Madam C.J. Walker, she was struggling to secure a fair payday. That's when James and his business partner Maverick Carter, both executive producers on the show, stepped in to advocate on her behalf. "When I asked for certain things, they had to go and say, 'She deserves these things!'" Spencer said in an interview with The Undefeated. "That type of leadership has been important, and I'm thrilled about it." 9. LeBron married his high school sweetheart. Savannah Brinson might have attended LeBron's rival high school, but when the senior sports star spotted the junior cheerleader, he asked her out. "I knew he loved me when I left my leftovers from dinner in his car," she told Harper's Bazaar in 2010 of their Outback Steakhouse date. "I'd totally forgotten about them, and he brought them to me. I think he just wanted another excuse to come and see me." The two have been an item ever since, even after LeBron's fame shot off the charts; they married in 2013 and have three children. "I just thought he'd be a hometown hero for his era and it would be over," Savannah said. LeBron, for his part, appreciates their shared history. 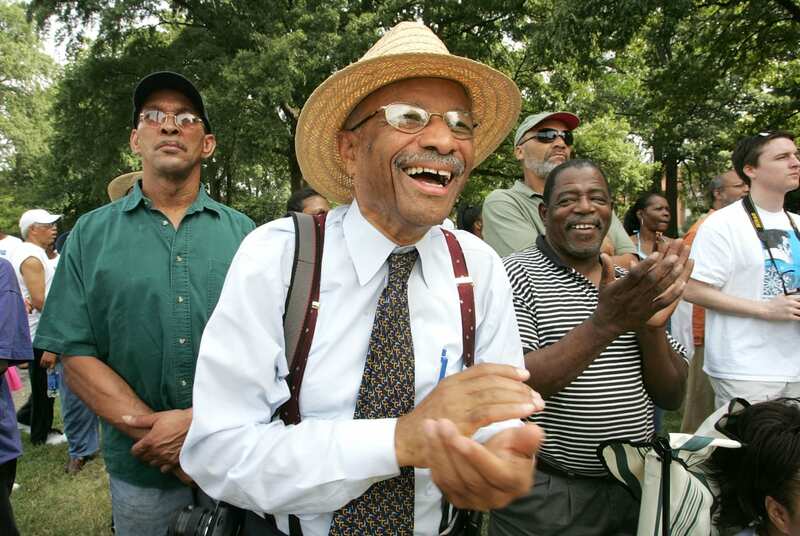 "[Savannah] was down when I was at my high school, no cameras, no lights. And she was there with me," he told The Hollywood Reporter in 2018. "You wouldn't be talking to me right now if it weren't for her." 10. LeBron has been compared to Michael Jordan since he was a kid—first on the court, and now on the silver screen. The opening scene of that 2002 Sports Illustrated feature—the one when James was a high schooler—showed the teen talking to the superstar as if they were old friends. "The moment feels charged, even a little historic," Grant Wahl wrote. "Remember that photograph of a teenaged Bill Clinton meeting JFK? Same vibe. Here, together, are His Airness and King James, the 38-year-old master and the 17-year-old prodigy, the best of all time and the high school junior whom some people—from drooling NBA general managers to warring shoe company execs to awestruck fans—believe could be the Air Apparent." Not only has James been living up to the MJ legacy on the basketball court, but he's hoping to at the theater. The original Michael Jordan kid-com Space Jam was the highest-grossing basketball movie ever, and the LeBron James-starring sequel is shaping up to be a slam dunk as well. A summer 2021 release date has been set (which will mark a convenient 25 years since the first intergalactic b-ball tourney), and Black Panther director Ryan Coogler has signed on as its producer. Of course, expectations are high after LeBron's surprisingly agile performance as a fictionalized version of himself in Judd Apatow's 2015 movie Trainwreck. Critic Ian Crouch even argued in The New Yorker that James was the funniest performer in a film that starred two bona fide comic heavyweights: Amy Schumer and Bill Hader. Here's hoping he can hold his own next to the Looney Tunes. 11. LeBron's son and namesake is also tearing up the basketball court. LeBron James Sr. once admitted that he may have made a mistake in naming his firstborn son after himself. The pressure that comes with being LeBron James Jr. could be knee-buckling, but "Bronny" has thrived on the come-up and is emerging as the next big thing. The eighth-grader is already dunking with ease at age 14, and he landed scholarship offers from powerhouse schools like Duke and Kentucky before turning 12. But his protective father—who certainly remembers a thing or two about being endlessly hyped as a teen—is definitely keeping a close eye on his son. "He's already got some offers from colleges," James told CBS Detroit in 2015. "It's pretty crazy. It should be a violation. You shouldn't be recruiting 10-year-old kids." But until then, LeBron is happy to sport Bronny gear, the way thousands of other kids wear his. Nothing livens up a sporting event quite like a team mascot—a polyester-filled costumed character that excites crowds, poses with fans, and raises team spirit. But sometimes, these harmless morale boosters wind up getting a little too involved in the action. Take a look at eight mascots who exceeded their boundaries and brought shame to the costume. Many well-known mascots are hired out to perform at private functions, spreading their trademark brand of cheer to people who recognize them from stadiums. The Phillie Phanatic, the Philadelphia Phillies's mascot of unknown species, saw one such side gig go awry in 2010, when he was booked for a wedding in New Jersey and thought it would be funny to toss a woman resting in a lounge chair into a pool. The unwitting participant, Suzanne Peirce, filed a lawsuit against the Phanatic, the Phillies, and the hotel that hosted the wedding, claiming she suffered shock and a herniated disc among other injuries. Because Peirce didn’t know who was in the suit at the time, she named several men known to wear the costume. The suit was settled in 2014, but the Phanatic still holds the distinction of being the most controversial mascot in sports. He has been the subject of several lawsuits, including one in which he allegedly damaged a woman’s knees by crawling on her and another in which he was blamed for hugging someone too hard. In 2018, he was accused of injuring someone in the stands by shooting them with a hot dog gun. These misadventures have earned him the nickname "the Big Green Litigation Machine." Despite the propensity of hockey players to punch opposing players when a dispute arises, their mascots are expected to keep the peace. Tommy Hawk, the cheerleading bird for the Chicago Blackhawks, was unable to keep his wings to himself in December 2018, when he responded to an aggressive fan by body-slamming him in the United Center arena concourse. The altercation, which went viral thanks to some intrepid fans with cell phone cameras, apparently ended with Tommy Hawk getting the best of his assailant. The next day, a Chicago police spokesperson told the Chicago Sun-Times they were still trying to locate the attacker. Tommy Hawk, who was not reported to have suffered any reprisals for the scuffle, is set to be inducted into the Mascot Hall of Fame in 2019. Basketball-nosed Burnie of the Miami Heat found himself playing defense in court after an October 1994 incident in which he dragged a spectator out by her legs during an exhibition game against the Atlanta Hawks in San Juan, Puerto Rico. The woman, Yvonne Gil-Rebollo, sued for $1 million, claiming severe tendonitis. Burnie had lousy luck when he picked Yvonne out from the crowd: Gil-Rebollo happened to be the wife of Puerto Rico Supreme Court judge Francisco Rebollo as well as the sister of Guillermo Gil Bonar, the island’s U.S. attorney. In 1994, a jury found the Heat liable for $50,000 in damages. Burnie has long had a penchant for causing trouble. In 1997, he was punched by Dolph Schayes, an NBA veteran whose son, Danny Schayes, played for the Orlando Magic. The attack came after Burnie sprayed Magic fans with a water gun. In 2015, the team was sued after the mascot lifted a teacher up during a school appearance to assist with a leg split during a dance routine and tore her hip. 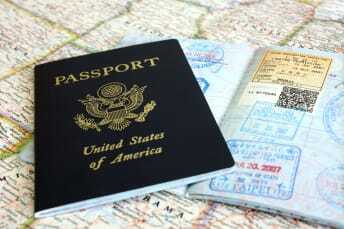 A confidential agreement was reached in December 2016. In 2018, an AmericanAirlines Arena security guard named Juanita Griffiths sued for a 2017 incident in which Burnie bumped into her while cavorting. She alleges that the collision caused her to fall and injure her leg. No resolution has been reported. Few team sports offer more emotional investment than college football, a highly territorial clash of teams that can lead to emotions running high. During a December 2010 game between the University of Cincinnati and Pitt, the Cincinnati Bearcat began to spend an inordinate amount of time pelting people in the stands with snowballs. After security cautioned him to stop, the Bearcat became unruly and officials were forced to wrestle him to the ground. He was detained and cited for disorderly conduct. Mascots often think of ways to put an entertaining spin on games, from dancing with fans to tossing giveaways into the crowd. In 1989, University of Miami mascot Sebastian the Ibis thought it would be amusing to walk onto the field carrying a fire extinguisher, ostensibly to put out the flaming spear of rival mascot Chief Osceola of Florida State University. Sebastian was spotted by a police officer, who was not enthused about the idea and tried to grab the extinguisher. In the ensuing melee, an officer was sprayed and Sebastian was tossed against a fence, while cops attempted to bend his wings behind his back. Perhaps sensing arresting a bird was not going to end well for anyone, authorities released Sebastian and cautioned him about trying to interfere with the ritual. The bird maintained he would never have actually put out the flame. When it comes to crossing over into hostile territory, it pays to be careful. That lesson was lost on Harvey the Hound, the mascot for the Calgary Flames hockey team, who opted to climb into the bleachers behind Craig MacTavish, head coach of the Edmonton Oilers, in January 2003. Following a protracted bit of taunting, MacTavish reached up, grabbed Harvey’s lolling tongue, and ripped it out of his mouth. A spokesperson for the Flames later said that Harvey was not supposed to be so close to the opposing team. Prior to an NCAA women’s basketball title match between the University of Tennessee and the University of Georgia in November 1996, Tennessee's mascot—a bluetick coonhound named Smokey—decided to have a little fun with a stuffed bulldog he brought out to center court for demonstration purposes. Smokey improvised a pro wrestling match, battering and smashing the plush animal with fierce blows. Smokey then delivered an elbow, which prompted his adversary to explode, the foam balls inside spreading all over the hardwood. After pausing for cleanup, game officials ejected Smokey. In 2013, Beth Fedornak was attending a Miami Marlins game and watched as a costumed character named Bob the Shark was trotted out as part of the entertainment between innings. In the performance, Bob races other sea creatures like Julio the Octopus and Angel the Stone Crab. Suddenly, Bob was upon Fedornak, and tried to mime biting her head. Fedornak claimed the interaction caused her severe neck pain and injuries. She sued in 2015. The case went to mediation in 2017 in the hopes of avoiding a jury trial, but no resolution was disclosed. The team ended the sea creature race in 2018, retaining only the services of a single mascot: Billy the Marlin.